Keeping chickens warm in the winter can be a bit difficult but they are pretty hardy creatures that come dressed in their own feather duvet. When it comes to the colder weather you need to make a few basic checks of your coop or ark that your poultry are being kept in dry draught free conditions. 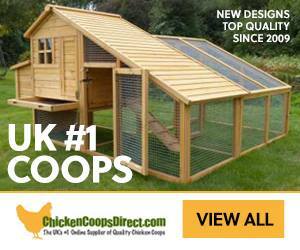 Make sure ventilation is above head height and that there are no draughts coming through the coop. The waterproofing needs to be checked and any areas that are dripping water into the housing need to be sealed quickly. Chickens and ducks don’t mind the cold but they do mind draughts and the rain at night so these are a top winter priority for them. If you have any escaping roosting chickens or hiding ducks now is the time to really encourage them to go into the coop. I know how difficult this is as I have two that climb one of my trees out of reach each night, but I am now trying harder to get them in by bribery such as cracked corn and even a small amount of pasta at bedtime. Although they hold body temperature well with their feathers keeping them toastie warm in freezing weather they do need shelter together as this allows them to share their body heat. Most poultry are creatures of habit so once you break the bad habits and get them going in at night they will continue doing so. You can usually tell if there are problems in you coop or housing if usually well behaved birds suddenly refuse to go in at night, this could mean there is a cold draught, water leaking or more likely the dreaded redmite in there. Most chickens will be fine through winter, but those who have moulted late or ex-battery hens who are not yet fully feathered need extra checks to make sure they are warm. Some people have been know to knit jumpers for their chickens to keep them warm in the winter, but unless you have a secure run I would not advise this as it makes them even easier prey for predators as they cannot fly as well to escape. I check my chickens over in the morning throughout the year and in especially in winter look out for any big changes in body weight, blue tinge to the wattle and comb and check their feet and legs as mud can lead to skin conditions which will need treating. In cold (below freezing) weather put Vaseline on the ear tips, wattles and combs to help keep them warm and safe from frostbite. On really cold nights put some old carpet with plastic over on top of the housing (making sure not to block ventilation) and this will keep them incredibly warm. 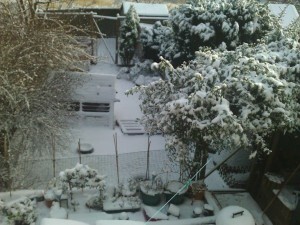 This article is part one of a 3 part series on looking after your chickens and poultry in winter. 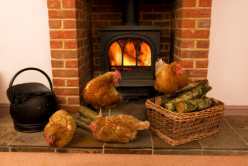 The first part, Keeping Your Chickens Warm in Winter, discusses housing and has a number of tips for dealing with very cold weather. The second part, The Chicken’s Garden in Winter, covers ways to keep the garden in some sort of order during winter when the hens can turn it into a mud bath. The third part, What & How to Feed Chickens in Winter, covers how to ensure your poultry have enough of the right things to eat and drink in Winter.